WILL IT MAKE OUR LIVES EASIER? CLOUD USAGE HAS ESCALATED WITH 50% IN JUST 5 YEARS. UPDATING YOUR SAFETY-CRITICAL PRODUCT IS THIS A NIGHTMARE WAITING TO HAPPEN? This is the “Digital” issue, and in it, I have an issue jam-packed with great content. 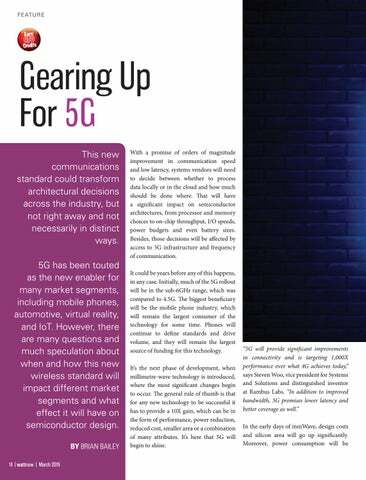 Our first feature article “Gearing up for 5G” could transform architectural decisions across the industry. It has been touted as the new market enabler for many segments. However, it leaves the sceptics asking ‘will it really live up to the standards? 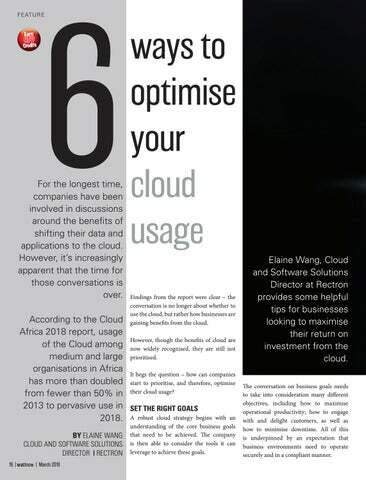 The second feature article on page 18 - “6 Ways To Optimise Your Cloud Usage” - was written by Elaine Wang and provides some helpful tips for businesses looking to maximise their return on investment from the cloud. Almost every primary product shipped nowadays includes embedded software and remote connectivity. 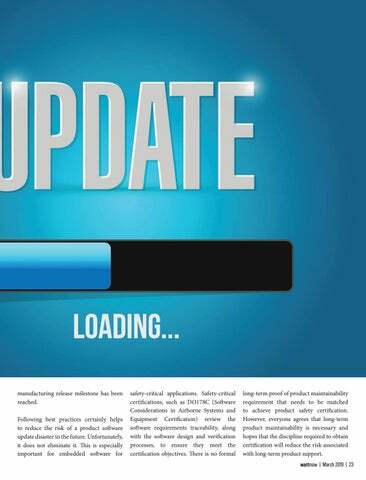 With relying on someone else to update your software, is this not a nightmare waiting to happen? Read more on page 22. Page 26 sports a survey the Service Desk Institute conducted during 2018 from businesses to find out if they really understand what “Digital Transformation” means. Senior Member Johan Basson wrote a letter as a concerned SAIEE Member on the “Challenges Facing South African Panel Manufacturers” – read more on page 48. Then, of course, the wattnow will not be complete without an article from Dudley Basson, who wrote an investigative piece on the new International System of Units, which changed the world’s definition of the kilogram, ampere, kelvin and mole forever. Find it on page 52. This month, we celebrate my dear friend, and technical editor, Jane Buisson-Street’s birthday. I want to take this opportunity to thank her for her diligent work in compiling the “Looking Back” article for the last 6 years – with the first one appearing in the April 2013 issue of wattnow! Happy birthday Jane! The SAIEE is hosting its Charity Golf Day in support of Ya Bana Village for Children on 24 April 2019. There are a few 4-ball spots available. Please contact Gerda (geyerg@saiee.org.za) to book yours for R3500. Herewith the March issue – enjoy the read! A job shadowing workplace experience and a post-school alumni programme are the initiatives of a unique public-private partnership, conducted under the banner of TechnoGirl. As a significant contributor to the growth of Science, Technology, Engineering and Maths (STEM) skills in South Africa, we at TechnoGirl are convinced that well-developed STEM skills are vital to our countryâ&#x20AC;&#x2122;s future competitiveness in the global economy. TechnoGirl would like to appeal to corporate South Africa to unlock the latent potential that exists in a primarily marginalised segment of our population â&#x20AC;&#x201C; young women at the beginning of their productive lives with potential in STEM. GET INVOLVED WITH OUR INITIATIVES JOB SHADOWING Starting at Grade 9 and continuing until the end of Grade 11, girls are given the opportunity to immerse themselves in actual work environments where they are then able to observe, engage and generally experience the day-to-day rewards and challenges of specific technical job roles. Shadowing sessions are scheduled over three consecutive school holidays, annually over the three years. ALUMNI PROGRAMME From Grade 12 onwards, girls join the Alumni Programme. This component supports them during their post-school education, access to industry networks and access job opportunities in their chosen field of study. Contact us today to find out how you can make a difference! Woman of the Year Award for her visionary leadership and IT strategy at Nkgwete IT Solutions. Since the company’s inception in 2012, Osman has expanded the team to 60 staff members and maintains a 41% female workforce. To date, part of Osman’s success has been her focus on creating significance. By creating jobs, mentoring people and empowering staff with technological tools and skills Osman has worked to develop a culture of relevance at Nkgwete. With digital transformation the main theme of Africa Tech Week, Osman says that Nkwgete IT Solutions is ready to answer the President’s call of Thuma Mina. “I am humbled and very excited about winning The Africa Tech Woman of the year award. Special thanks to TopCo media for creating this platform and the South Africa UK Tech Hub for the sponsorship. Winning this award will enable me to do so much more for Tech in Africa,” she says. Africa for its launch in South Africa in May 2013. “My interest in lightning protection from an engineering and scientific perspective meant that this was a very positive career step for me. I couldn’t turn down the opportunity to become involved with the opening up of the African subsidiary of a fourth-generation, 100-year-old international lightning protection company.” “As with my previous job in Madagascar, the requirements of being involved in this new venture spoke to my entrepreneurial spirit and my interests in cultivating an international engineering perspective. At DEHN Africa, we are involved in working on many projects around the world, including within Indonesia, the Philippines, Singapore and Malaysia, while in Africa itself we’ve been involved in projects in Madagascar, Zambia, Kenya, Botswana and Namibia, besides South Africa itself, of course.” Oelofse is excited about DEHN Africa’s planned trajectory during 2019 and beyond. “The DEHN global plan for 2025 was released globally,” he explains, “and DEHN Germany has exciting initiatives and goals in the company’s drive towards growth. At DEHN Africa we are looking forward to playing our part in the global vision. Hano Oelofse Managing Director | Dehn Africa focus, and I try to fit in races at the weekend. For me, running is like a metaphor for life, because if you keep on pushing and focusing, you will eventually get to where you want to be,” he concludes. From left: Nicky de Bruyn, Uplands Outreach; Ziyanda Makiwane, Sasol; Katia van der Merwe, Uplands Outreach; Beauty Mashego Mthambo, Uplands Outreach; Dean Somerset, Sasol; Joanne York and Violah Moyah Uplands Outreach. Seven schools from the Insikazi School Circuit area in Mpumalanga benefited from a computer donation from Sasol Energy yesterday. This donation forms part of a Sasol Energy-funded digital literacy programme that educators from the circuit attended last year, overseen by the Uplands Outreach project. The digital literacy programme consisted of lessons on computer hardware and software basics, emailing, internet usage, as well as Microsoft Office, including Word, Excel and PowerPoint. This is the second year that Sasol Energy has worked with the Uplands Outreach project on this initiative. Uplands Outreach works closely with partner schools in the Insikazi School Circuit area with the aim of elevating educational achievements and making a sustainable impact. “We are passionate about helping teachers to gain the confidence and the experience to use technology to streamline parts of their working lives,” said Uplands Outreach Director, Dr Nicolette de Bruyn. “We thank Sasol for partnering with us to fulfil this need. We are pleased with the level of commitment demonstrated by teachers and the 100% pass rate of all teachers who enrolled for the Digital Literacy courses.” “The outreach programme is indicative of our commitment to education that seeks to promote people-centred, needs-driven and sustainable development of the communities in which we operate,” concluded Somerset. electric motor thereby facilitating optimum control of the pumping installation. This allows greater effectiveness when irrigating. users can eliminate the need for specialised equipment and be able to take remedial action as soon as possible. How beneficial are local cloud data centres for SA business? DATA CENTRE ORIGINS Data centres have initially always been something a company keeps on-premises. Physical infrastructure which stores the critical data needed for the business to continue operations. However, data centres need to evolve along with the changes in expectations of both consumers and companies for “always on” systems. On-premises servers are still seeing growth, and depending on their unique needs, it might even be the best option for a business. However, cloud data centres will be especially advantageous for small and medium-sized enterprises as not all companies have or can afford to have, the secure server rooms needed for onpremises data centres. and in any industry, cloud data centres can reduce the costs of updating or replacing legacy software, increase efficiencies and reduce latencies. Overcoming latency issues is extremely important for businesses as it is an ample reason why some applications cannot be moved to the cloud. Load shedding is also a unique challenge that companies in South Africa face, as blackouts can cause onpremises data centres to lose data, which can be extremely costly. Use of enterpriselevel cloud data centres can eliminate the possibility of data loss as a result of a sudden loss of electricity. be compliant and complementary to POPI, government, government agencies and municipalities, and the financial sector will feel much more comfortable with storing their data on the cloud, but still within the country. SECURITY A cloud data centre is critical infrastructure for cloud computing, and as cloud computing, there are still some concerns as to its safety. However, cloud data centre infrastructure is secure as long as it is in the Trusted Cloud. While there has been an increase in attempts to hack cloud infrastructure, there are still many cloud services, like Microsoft’s Azure, which has never been hacked. The vulnerabilities in a cloud data centre mainly lie in the user, those managing and accessing it, due to the checks and balances the data centre employs. “This is particularly true of small to mediumsized businesses, who are more at risk due to their limited ability to maintain security and generate revenue during downtime,” he explains. For example, a Uninterrupted Power Supply for basic home use, will allow a WiFi router to run, cell phone chargers to operate, and the safe shut down of a single PC, below 500watts. “And while many people are turning to generators to get them through loadshedding, soaring petrol prices mean this is an expensive and not very eco-friendly way to go. However, for both homes and businesses, an Uninterrupted Power Supply (UPS) can protect businesses against downtime,” he adds. Uninterrupted Power Supply solutions protect and save the electronic equipment we rely on so heavily, and are scalable according to different needs, says de Leeuw. “When selecting the right Uninterrupted Power Supply solution for your needs, consider that a Uninterrupted Power Supply should have an output watt capacity 20-25% higher than the total power drawn by any attached equipment,” cautions de Leeuw. “Moreover, runtime is important, giving an indication as to how long an Uninterrupted Power Supply will be able to power its attached equipment in the event of a power disruption.” Lastly, he advises to test all equipment by unplugging the Uninterrupted Power Supply periodically to make sure all attached equipment stays powered. With a promise of orders of magnitude improvement in communication speed and low latency, systems vendors will need to decide between whether to process data locally or in the cloud and how much should be done where. That will have a significant impact on semiconductor architectures, from processor and memory choices to on-chip throughput, I/O speeds, power budgets and even battery sizes. Besides, those decisions will be affected by access to 5G infrastructure and frequency of communication. It could be years before any of this happens, in any case. Initially, much of the 5G rollout will be in the sub-6GHz range, which was compared to 4.5G. The biggest beneficiary will be the mobile phone industry, which will remain the largest consumer of the technology for some time. Phones will continue to define standards and drive volume, and they will remain the largest source of funding for this technology. It’s the next phase of development, when millimetre-wave technology is introduced, where the most significant changes begin to occur. The general rule of thumb is that for any new technology to be successful it has to provide a 10X gain, which can be in the form of performance, power reduction, reduced cost, smaller area or a combination of many attributes. 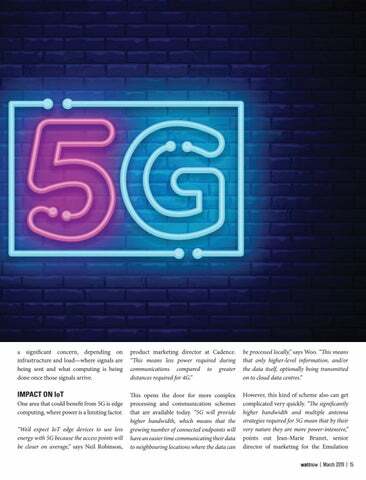 It’s here that 5G will begin to shine. a significant concern, depending on infrastructure and load—where signals are being sent and what computing is being done once those signals arrive. ways to optimise your cloud usage Findings from the report were clear – the conversation is no longer about whether to use the cloud, but rather how businesses are gaining benefits from the cloud. However, though the benefits of cloud are now widely recognised, they are still not prioritised. It begs the question – how can companies start to prioritise, and therefore, optimise their cloud usage? SET THE RIGHT GOALS A robust cloud strategy begins with an understanding of the core business goals that need to be achieved. The company is then able to consider the tools it can leverage to achieve these goals. The conversation on business goals needs to take into consideration many different objectives, including how to maximise operational productivity; how to engage with and delight customers, as well as how to minimise downtime. All of this is underpinned by an expectation that business environments need to operate securely and in a compliant manner. By identifying the goals, the business can start engaging with consultants that can advise on a variety of tools to achieve these goals, assisting them to set short, medium, and long-term plans. At this point, businesses should also weigh up the benefits of using cloud applications versus traditional on-premise hosting. Understanding what cloud means to your business is very important. A recent study shows that companies that are easily able to articulate the value of the cloud to their companies see a higher return on investment from the cloud. These businesses typically see a 51% increase in top-line revenue originating from the cloud. Cloud usage continues from page 19 This individual can then monitor the business’ progress, mapping it against your original cloud goals. Never underestimate the importance of keeping your business accountable to its original objectives. After that, identify the individuals responsible for the technical delivery. This typically involves someone from the IT department in the organisation, but should also include external service providers. DATA RESIDENCY CONSIDERATIONS With local legislation such as the Protection of Personal Information Act dictating how data should be managed and stored within an organisation, many businesses do not feel comfortable storing their business outside of South Africa. As such, considerations around where the data is stored will have an impact on the solution the business ultimately chooses to implement. It’s also worth noting that if your business makes use of modern cloud-based applications, they can communicate with one another. This means that your businesses can have key applications talk to one another to generate valuable insights and develop better products and services for your customers. CALCULATE THE COST OF DOWNTIME Another critical question revolves around the level of security your business requires. It’s critical to ask yourself how much downtime would be acceptable for a particular application. Once you establish the cost to your business of that downtime, you will then have a clearer idea of how much to invest in making the application highly available. In addition to the uptime guarantees that reputable cloud vendors offer, one also needs to consider the obvious – what happens if the physical infrastructure at the office fails? Think, for example, of the increasing possibility of power cuts and loss of Internet connectivity. Cloud providers like Microsoft offer a range of different security controls, and it’s also useful to know that opting for a Disaster Recovery Plan can help make your information even more secure. Should the worst happen, all your data will be safely backed-up. CONSOLIDATION OF TOOLS It can be challenging to navigate the plethora of tools available in the market and businesses need to consider how the options they select will be used and managed within the organisation. From a user perspective, it might make more sense to log onto one central portal, using single sign-on rather than having to log in to multiple different portals. From an administrative point of view, it may also be easier to manage tools when they are consolidated from a central portal that monitors all services, rather than having to maintain multiple disparate systems. Finally, businesses should also determine the types of files their organisation needs to store, accurately assessing each of these items’ storage requirements. In this way they can ensure the capacity they purchase directly correlates to the organisation’s needs, ultimately helping the business to avoid unnecessary costs. By walking through a few of these basics principles, your business can genuinely start to optimise its cloud usage. This ultimately will lead to higher returns for your company and a robust platform from which you can continue introducing innovation to your business. There is an Afrikaans saying: ‘Goedkoop is duur koop’, which, translates to ‘buying cheap is buying expensive’. This is particularly relevant in the power sector, we’re getting it wrong by using inferior products, and unreliable suppliers can incur massive additional costs. As sub-Saharan Africa races to address the power deficit, we will see a growing number of power facilities being rolled out across the region. As with any sector boom, a wave of suppliers will enter the market looking to cash in on the growth. Some of them will be fly-by-night companies offering inferior products at bargain basement prices. Contractors and installers looking to boost their margins should view these suppliers with caution, however. On the face of it, cutting the cost of cable and accessories may appear to be an excellent way to reduce the project costs and win the tender. But in the long term, there are hidden costs associated with partnering with untrusted suppliers. For example, should a supplier lack nationwide technical support resources, an installer might lose days on the installation while awaiting technical back-up from the vendor. If the supplier has insufficient cable and accessories in stock, installation could be delayed for weeks pending an order from overseas. Modern connectivity (when combined with an embedded software update capability) allows software developers to fix software bugs even after the product has shipped. However, this also creates some new challenges in terms of increased expectations that the end product will be maintained for a much more extended period. 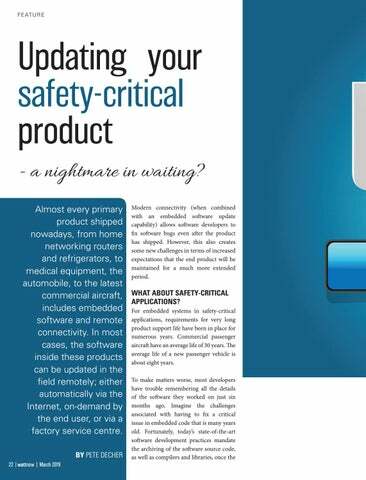 Updating your safety-critical product continues from page 23 However, hope is not a plan. As an experienced project manager, you plan and execute carefully to avoid future disaster. You archive your entire source tree (which you’ve meticulously maintained under source control) including source code, makefiles, toolchain, and test suites. You verify that you can reproduce the exact binaries that were released to manufacturing, even going so far as to build the binaries “off network”. You have stored copies offsite as part of a disaster recovery plan. You have done everything you can think of to ensure reproducibility, so you have nothing to worry about. You can sleep well at night. Or can you? CHANGING REQUIREMENTS It is an unfortunate fact of life that the only constant is change. Things will change in your product space. New legal requirements will be imposed, possibly forcing new code development. Critical vulnerabilities may be uncovered in your product, requiring software patches to protect your customers. Also, products have been known to exhibit bugs when exposed to a broad customer market. The reality of product life cycles is that you are at some point almost certainly going to have to update, rebuild, and deploy your product software. Given your careful preparations, most of the time this will not be a problem. However, in the case when it does become a problem, it can be a huge one with expensive ramifications. semaphore incompatibility to the build inconsistency delayed product shipment by six months and cost over $100k in consultant time in addition to the developers’ time. 4. An application that was developed under a compiler that had a known problem of generating incorrect branch code for “long branches” was carefully tailored to avoid triggering the bug – all branches were ensured to be short. However, the updated compiler implemented loop unrolling, causing the branches to hit the compiler bug. When the compiler generated the incorrect code, the code jumped to a random location, which would then continue for quite a while before either triggering a core dump or inaccurate results. Tracking down the problem and disabling the unrolling option delayed shipment by two weeks. These outcomes do not lead to sleepful nights for project managers. There is no good way out of these problems. The key to restful sleep is not getting into them. they are found and fixed. As a result, to patch a just-fixed CVE in your five-year-old compiler, you can’t just apply the CVE fix. You have to reapply every fix that has been used to that compiler in the past five years. That is not a small number, and that is not an approach that minimises changes. The problem is even worse when your product is safety certified. Anyone who has taken a software product through a safety-certification process is well aware of the pain and cost involved. A re-released product has to be recertified. If you have to take your revised product through the entire certification process, you are looking at another year delay in release beyond the delay resulting from any problems, you’ve encountered. a random collection of changes aggregated over a long period. This approach minimises the overall changes to the toolchain, and thus, the risk of introducing any new issues into the product along with your intended fix. Also, a detailed report covering all the changes made to the toolchain should be available to ease the safety critical certification review. business to work holistically to understand how Digital Transformation can benefit them and help their business to evolve and become more efficient, as well as provide new ways to support business customers and ultimately offer a better customer experience. Between March and April 2018, the Digital Transformation survey was sent to a wide variety of service desk professionals, from both public and private sector service desks and an extensive range of organisation sizes. designed to improve efficiency, productivity, and customer experience. Transformation does F EAT UR E not just affect the service desk, or even just IT; it affects the whole organisation. ately provide a better customer experience. ate sector service desks and a large range of organisation sizes. service undertaken a Digital (Table 1) - Of the 69% of respondents that are undertaking or plan HAS desk/business YOUR SERVICE DESK/ to conduct a Digital Transformation project, the majority reviewed BUSINESS UNDERTAKEN A DIGITAL mation project? TRANSFORMATION PROJECT? and refined their processes in preparation. No matter what the project entails, it is essential to evaluate and improve processes, as doing this will highlight inefficient and wasteful processes which may be taking up valuable time and resources, both of which are crucial for a successful Digital Transformation project. 65% and 63% engaged with their customers and the service desk team, respectively. It is encouraging to see that the majority of respondents have consulted their customers to discuss what they require from new implementations, as this signifies that these service desks follow a more customer-centric approach to service (Fig 1) Nearly half of respondents specified that their service desk management, which fosters a better customer experience and, if dents specified that their service desk has undertaken a Digital Transformation project, and over a had undertaken a Digital Transformation project, and over a applicable, customer adoption of an implementation. quarter highlighted that there are plans to do so in the near future. 31% identified that their service desk is not currently undertaking It is also essential to engage with service desk staff to discuss the implications that ifa new application may have. y kind can be a scary prospect andproject. it can be difficult for some to accept However, a Digital Transformation Transformation ofpeople any kind can change. change and do not adapt, they risk becoming irrelevant. Digital Transformation is no longer something be a scary prospect, and it can be difficult for some people to accept e, but it is important for organisations to understand the capabilities and limits ofFor the example, support function a self-service portal can remove some of the more change. However, if organisations resist change and do not adapt, Digital Transformation project. repetitive and time-consuming tasks from a service desk analyst, they risk becoming irrelevant. Digital Transformation is no longer something businesses can ignore, but it is essential for organisations such as incident or service request logging, categorisation, and to understand the capabilities and limits of the support function prioritisation. before undertaking a Digital Transformation project. However, it also adds potential new responsibilities that analysts may need to undertake, such as ensuring the information the CURRENTLY, UNDERTAKING OR customer has inputted during the self-service process is extensive PLANNING TO UNDERTAKE A DIGITAL enough or updating the status of the incident or request through TRANSFORMATION PROJECT the portal. Communicating with the service desk team is crucial to ensure they understand the changes to their workload and WHAT DID YOUR SERVICE DESK/BUSINESS environment that may occur. DO TO PREPARE FOR YOUR DIGITAL Transformation project. Depending on the type of implementation a Digital Transformation project entails, you may need to engage with potential tool vendors or technology partners. This action has been undertaken by 59% of respondents. It is crucial to spend ample time when researching potential vendors, as you need to be sure that the tool or technology you are investing in will meet the needs and expectations of your service desk, organisation, and customers. It is also essential to work closely with vendors and ensure they understand your business and its requirements. 48% of respondents highlighted that their service desk had to create a business case, and similarly, 30% had to obtain additional budget. A Digital Transformation project is a significant undertaking for any organisation. Therefore this is an important step to consider before beginning a Digital Transformation project. Furthermore, depending on the size of your organisation and implications of your project, it may be necessary to appoint as Digital Transformation Officer to manage and oversee the progress of the project, particularly if it will impact multiple areas of the business. WHAT WERE THE MOTIVATIONS BEHIND UNDERTAKING A DIGITAL TRANSFORMATION PROJECT? (Table 2) As previously explained, Digital Transformation is about the implementations designed to improve efficiency, productivity, and customer experience. An incredible majority of respondents, almost 90%, specified that one of the motivations behind undertaking a Digital Transformation project was to improve the customer experience. Furthermore, 78% of respondents pointed out that they were motivated partly by the increased productivity that a Digital Transformation project and its implementations could offer. Moreover, improving the productivity and efficiency of the service desk can also signify that there are lower costs associated with service, which, as specified by 52% of respondents, is an attractive motivation for undertaking a Digital Transformation project. 48% of respondents pinpointed that they were motivated by the prospect of achieving a reduction in analystsâ&#x20AC;&#x2122; workloads. Technologies like self-service can reduce the amount of repetitive, time-consuming tasks that service desk analysts typically perform, thus freeing up the time to perform more complex tasks, attributing to the overall productivity and efficiency of the support function. Over half of respondents highlighted that they were also motivated by chance to improve relations with other areas of the business. Newer frameworks, methodologies, and ideologies, like Development and Operations (DevOps), promote communication and collaboration across multiple areas and teams across the enterprise. Furthermore, if the goal of improved productivity is successful, this can improve the businessâ&#x20AC;&#x2122; perception of the service desk, and therefore potentially improve the relationship between the service desk and the bigger company. Digital Transformation desk and the wider business. Which of these does your Digital Transformation project entail? high-volume, repetitive tasks and automate complex processes. It would be interesting to see how this statistic changes in 2 years, as by this time, more advanced technologies may become more accessible for a broader range of organisations. as AI or ML technologies, as failing to fully understand the needs of the business or the support function c introduction of technology that is not used to its full potential. Do you have a dedicated Digital Transformation t comes in the form of technology, framework, methodology, or otherwise. As such, it is interesting to see that 59% of respondents highlighted their service desks’ Digital Transformation project includes implementing frameworks, methodologies, or ideologies such as DevOps or Agile. ch is Artificial Intelligence (AI)/Machine Learning HOW MUCH IS ARTIFICIAL INTELLIGENCE ying(AI)/MACHINE a part in your Digital Transformation project? LEARNING (ML) PLAYING A PART IN YOUR DIGITAL TRANSFORMATION PROJECT? The majority of respondents, however, specified that there is no dedicated Digitalto Transformation theirto project. Transformation project, it may be necessary implement a teamteam whichheading is dedicated managing and progress of the project. 36%Ideally, respondents highlighted thathave they ahave a dedicated Digital team Transformation t organisations may project management or project management office who would manage such technology The majority of respondents, however, specified that there is no dedicated Digital Transformation team h implementation projects. However, it would be interesting to Ideally, organisations may have a project management team or project management office who would know where further responsibility of such a project lies in these technology implementation projects. However, it would be interesting to know where further responsibilit the service desk, IT managers, business managers, lies in these organisations; organisations; the service desk, IT managers, business managers, or another department or this affects the efficiency and productivity of their regular tasks. or another department or individual, and how this affects the efficiency and productivity of their regular tasks. (Fig 2) - 55% of respondents highlighted that they are not currently WAS THERE A PUSH TO UNDERTAKE A to highlighted implement that AI they or ML partcurrently of theirimplementing organisation’s DIGITAL TRANSFORMATION PROJECT? IF SO, 7 ly, 13% ofplanning respondents areas either or have implemented AI or ital Transformation project. Digital Transformation project, with 40% of this group monitoring WHERE DID THIS COME FROM? the impact these technologies are having on the ITSM industry. f respondents specified that they are currently researching AI and ML with intent to implement, and a Conversely, 13% of respondents highlighted that they are either king with a potential partner. Both these stages are crucial before implementing something as significant currently implementing or have implemented AI or ML as ogies, as failing to fully understand the needs of the business or the support function can lead to the ofnot a used Digital Transformation project. Almost a quarter of hnologypart that is to its full potential. respondents specified that they are currently researching AI and ML with intent to implement, and a further 9% are working with a potential partner. Both these stages are crucial before performing something as significant as AI or ML technologies, as failing to fully understand the needs of the business or the support function can lead to the introduction of technology that is not used to its full potential. ave a dedicated Digital Transformation team? Digital Transformation continues from page 31 There are challenges and benefits to both sides of this issue, as a push from customers can signify that the service is lacking and that customers are dissatisfied, or that they have been consulted on how they want to see the support capability developed with a Digital Transformation project. Similarly, with the push from management, there should be a balance to avoid service issues being created, by implementing changes too quickly for customers and perhaps service desk staff to be comfortable with, such as not considering the impact on the business and customer experience. (Fig 4) - It is very encouraging to see that over half of respondents highlighted that their service desk team received the decision to undertake a Digital Transformation project positively and had a good outlook. Digital Transformation often means change, and generally, people can be averse to change and resist it. 43% of respondents highlighted that the service desk pushed for Digital Transformation. This high number indicates that these service desks are looking to encourage their organisations to invest and innovate to become more efficient. Ensuring an organisation recognises the value of a service desk, and that the service desk can fully articulate its business value is a key consideration when trying to secure a budget for such initiatives. For many staff in low-level positions, the prospect of technology replacing them in their role is a common concern. Therefore, it is understandable that 36% of respondents highlighted that their team had such concerns, but it is promising to note that these respondentsâ&#x20AC;&#x2122; teams were mostly positive about the project. There were also respondents who identified that the push for a Digital Transformation project came from more than one source. Therefore, it is essential to adequately communicate the implications new implementations can have and discuss their concerns and work to ease any transition, mainly if it entails a culture shift. 11% of respondents highlighted that service desk staff had a significant number of concerns, but as previously noted, it is essential to work with the support team to ease their worries and communicate the benefits a Digital Transformation project can have. This could signify that the service desk, management, and customers are all on the same page and that through crossfunctional collaboration and productive business relationship management, these respondent organisations are moving forward together for the benefit of the whole organisation. The majority of respondents, 53%, identified that the service desk team had a positive outlook. It is also important to note that no respondents highlighted that their team resisted the decision to undertake a Digital Transformation project. It could also signify, however, that multiple business stakeholders see Digital Transformation as a popular trend and a way to fix for a less than active service. This could signify that service desk staff understand that Digital Transformation will have a positive on the service desk and broader organisation. w was decision a Digital HOWthe WAS THE DECISIONto TOundertake UNDERTAKE A DIGITAL TRANSFORMATION PROJECT ansformation project received by service desk staff? RECEIVED BY SERVICE DESK STAFF? u have a Digital continues from page 32 Transformation strategy, how often do review it? and the project will continue to meet the service desk’s and and as previously mentioned, this can lead the strategy and project 18% of respondents specified that is never reviewed, and as previously mentioned, this as a their wholestrategy to ultimately fail. Furthermore, 9% who review their business’ aims. and project as whole to ultimately fail. Furthermore, the 9% who review their strategy less often than strategy less often than once a year may also encounter issues as encounter issues as their project progresses. A project may run into trouble if the environment detailed in a their project progresses. strategy is different from reality, therefore, 9considering some Digital Transformation projects involve changes which would affect an organisation’s infrastructure, it is a good idea to regularly review your strategy to prevent any issues further down the line. HOW LONG WILL YOUR DIGITAL How long will your Digital Transformation TRANSFORMATION STRATEGY/PLAN LAST? strategy/plan last? 4% of respondents highlighted that their strategy is reviewed on an ongoing basis. This is undoubtedly an excellent way to ensure the approach remains relevant, but it is essential to ensure that this does not require too many resources or impede on the performance of the service desk. being too lengthy to the point where it restricts progress. How far along is your Digital Transformation proje far along is your Digital Transformation proje which is too long with no clear endpoint mayHow be challenging to manage, mainly if it is poorly maintained or not reviewed regularly to ensure it is still relevant to the organisation’s goals. The most significant portion of respondents specified that their strategy would last 1 to 3 years; this is a reasonable length of time, as it balances the project being long enough to give it the best chance of being successfully carried out, with the strategy not being too lengthy to the point where it restricts progress. How successful has your project been so far? How successful has your project been so far? time to meet requirements and targets. promotes a more fluid, agile and fast-paced approach to service management. It also has the benefit of enabling the service desk to HOW SUCCESSFUL HAS YOUR PROJECT BEEN stay relevant alongside the continually evolving technologies and SO FAR? trends the industry faces. Has Digital Transformation impacted your project continues from page 35 completion speed? YOUR PROJECT COMPLETION SPEED? aster as a result of their Digital Transformation initiative. Digital Transformation project is still in its early stages, the service desk may still be adjusting to changes, and therefore processes and projects are progressing slower than usual. (Fig 9) - One of the expected outcomes of Digital Transformation is faster project completion speed, supported by increased he majority of respondents specified that they have seen no noticeable change to their project completion speed. productivity and performance. 36% of respondents highlighted NOT UNDERTAKING A DIGITAL PROJECT? Considering only 20% of respondentsâ&#x20AC;&#x2122; Digital Transformation projects are past the initial phases and deployment, it is that they have indeed noticed that they are making progress faster nderstandable that the majority have not seen improvement in project completion speed yet. DO YOU THINK YOUR BUSINESS WILL as a result of their Digital Transformation initiative. UNDERTAKE A DIGITAL TRANSFORMATION PROJECT IN THE NEAR FUTURE? The majority of respondents specified that they had seen no noticeable change to their project completion speed. Considering (Fig 10) - Of the 31% of respondents who had initially stated here are less available resources for other tasks. Alternatively, if a Digital Transformation project is still in its early stages, the only 20% of respondentsâ&#x20AC;&#x2122; Digital Transformation projects are past that their organisations are not currently undertaking a Digital ervice desk may still be adjusting to changes and therefore processes and projects are progressing slower than usual. the initial phases and deployment, it is understandable that the Transformation project, nearly 70% specified that they believe majority have not seen improvement in project completion speed that they will conduct a Digital Transformation project soon, with 45% of this group determining there is already plans and budget yet. for it. The remaining 55% identified that while they think their Unfortunately, 7% of respondents specified that they are now organisation will undertake a Digital Transformation project, there performing slower than before. This could be for a multitude of are currently no plans to do this. 33% of respondents specified reasons; perhaps the shift of focus to the project has removed that they do not believe their organisation will conduct a Digital resources and staff from their usual tasks, signifying that there Transformation project soon, but 63% of this group identified that are less available resources for other functions. Alternatively, if a they might undertake a project in the distant future. Do you think your service desk/business will undertake a Digital Transformation project in the near future? is still significant, and it is important to understand why some organisations choose not to, or simply think they are unable t undertake a Digital Transformation project. How prepared is your service desk/business for a Digital Transformation project? Only 11% of those currently not undertaking a Digital to undertake a Digital Transformation project, there is still a long As seen earlierproject in thishighlighted report, before a Digital is crucial review IT infrastructure way to go. The project, remainingit 32% believetothat theiryour service desk or Transformation that undertaking it is unlikely that their Transformation the supportwill function’s andproject resources, the business needs in terms of service. and Pastthat this, ther business isand not customers’ at all prepared for Digital Transformation organisation begin acapabilities transformation at all.and While are a multitude of things to consider when planning a Digital Transformation strategy in terms of skills and abilities; th a this is a small proportion of the total number of respondents, it there are insufficient resources and infrastructure to undertake from internal staff to implement andto develop changes or tools,project. to theWhile service staff’s skills to maintain service levels thisdesk is a significant proportion of respondents, it is and isofstill significant, and it is essential understand why some organisations choose not to or merely think they are unable to, promising to note that they recognise the need to be prepared for transformation. undertake a Digital Transformation project. HOW PREPARED IS YOUR SERVICE DESK/ BUSINESS FOR A DIGITAL TRANSFORMATION PROJECT? Transformati IS 13 THERE A SPECIFIC REASON YOURDigital SERVICE DESK/BUSINESS WOULD NOT UNDERTAKE A DIGITAL TRANSFORMATION PROJECT? (Table 5) - As previously mentioned, it is essential to understand why some respondents feel their service desk would not, or is unable to, undertake a Digital Transformation project. This will give us an insight into what the industry struggles with daily, and what factors inhibit the transformation and development of a service desk. Most issues facing the service desk derive from lack of budget, time, and resources; this is evident here with these factors claiming the top 3 reasons as to why an organisation may not undertake a Digital Transformation project. nise the need to be prepared for transformation. ould not undertake a Digital Transformation project? What benefits could your organisation realise from Digital Transformation? rces, this may not be a viable option for some service desks. clear that the industry understands the importance and potentially the benefits of better communication and relationships across the business, IT, and the service desk. that they could realise cost savings as a result of Digital Transformation. It would seem that many service desks struggle to gain buy-in from relevant business stakeholders and justify the necessary budget, despite the potential Return on Investment (ROI). There is potentially a the service desk’s desire relationship between IT and the business, the workload reduction for analysts, and the lack of buy-in or perceived necessity s unable seen in the previous question. If a daily company does not realise the importance of the IT support function, it may not esk derive be able to understand the need for the y an service desk, and IT as a whole, to evolve and transform with new technologies, At the beginning of this report, Digital Transformation was defined as the catalytic implementations designed to imp Fig 12 frameworks, methodologies, efficiency, ideologiesproductivity, and customer experience. There is a misconception that “Digital” implies that every aspect o (Fig 12) - Atbase, the beginning ofnot this report, Digital Transformation was defined thealso allow benefit project must be technology yet this does encompass frameworks and methodologies whichascan rom and so on, which could ultimately improve efficiency, productivity, and customer organisation progressimplementations and enhance theirdesigned IT supportto function. that tocatalytic me at the broader organisation. It is crucial At the beginning of this report, Digital Transformation was defined the catalytic implementations designed to im experience. There is a misconception that “Digital”asimplies that every aspect of a project the business and IT work together to be efficiency, and customer experience. There is a misconception that “Digital” implies that every aspect io ced When askedproductivity, how far they agreed with the above statement, 61% of respondents agreed that Digital Transformation able to understand the importance of each must be technology base, yet this does not encompass frameworks and methodologies project must be technology base, yet this does notthis encompass frameworks and methodologies which can also about implementing new technologies, with 21% of group strongly agreeing. The remaining 39% disagreed withallo th keholders other’s roles in the organisation, what their which can also allow an organisation to progress and enhance their IT support function. Digital Transformation is all about implementing new technologies? organisation to 12% progress enhance IT support function. statement, with of this and group stronglytheir disagreeing. dents needs who are, and how they can work together When askedagreed how far agreedstatement, with the above statement, 61% of respondents agreed to improve the overall efficiency and how When asked far they withthey the above 61% of respondents agreed that Digital Transformation nisation. farthatdo you agree with the statement that framewo Digital Transformation allofabout implementing new technologies, with39% 21% of this with t about implementing new technologies, withis21% this group strongly agreeing. The remaining disagreed productivity of the organisation.How hich may statement, with 12% ofstrongly this group stronglyThe disagreeing. group agreeing. remaining 39% disagreed with this statement, with 12% of and methodologies, such as DevOps and ITIL, are a part A workload reduction for analysts has this group strongly disagreeing. Digital Transformation? How far do you agree with the statement that framewo and methodologies, such as DevOps and ITIL, are a par Digital Transformation? also been identified as a key benefit which organisations, specifically service desks, HOW FAR DO YOU AGREE WITH THE STATEMENT THAT ot FRAMEWORKS AND METHODOLOGIES, SUCH AS DEVOPS AND placecould realise from Digital Transformation. As previously seen, shifting analysts ITIL, ARE A PART OF DIGITAL TRANSFORMATION? more repetitive and time-consuming tasks to technologies like self-service and automation can significantly improve the desks productivity and efficiency of the service desk staff, and freeing up their time can significant allow analysts to take on more valuable ation Considering the responses to the previous question, one could expect a mirrored result in this question. Interestingly tasks. when asked how far they agreed with the above statement, almost 90% of respondents specified that they agreed, w of this group strongly agreeing. Only 12% disagreed, with 2% of respondents strongly disagreeing. Digital Transformation continues from page 39 (Fig 12) - Considering the responses to the previous question, one could expect a mirrored result in this question. Interestingly, however, when asked how far they agreed with the above statement, almost 90% of respondents specified that they agreed, with 44% of this group strongly agreeing. Only 12% disagreed, with 2% of respondents strongly disagreeing. CONCLUSION With the majority of organisations currently undertaking or planning to conduct a Digital Transformation project, it is clear that the importance of evolving and transforming IT services is understood among the industry. Of the respondents that stated a Digital Transformation project is not currently in the pipeline, nearly 70% identified that they believe their organisation will undertake a project in the future. re isDOaYOU pressure from the business/ FEEL THERE IS PRESSURE FROM THE BUSINESS/ CUSTOMERS TO KEEP UP WITH Industry professionals highlighted that there are several steps that keepDEVELOPMENTS up with developments in the industry? IN THE INDUSTRY? their service desk or business took to prepare for their Digital Transformation project, such as reviewing processes, engaging with customers, and obtaining additional budget. The most common implementation for organisations was identified as self-service, which is interesting to note as self-service is not a new technology. Customers then come to expect similar levels of customer service and a better overall experience of the services they are provided in a working environment. At some point, corporate business IT departments will need to develop their approach to service and use customer feedback to improve the service they provide. and buy-in can also present problems for support functions attempting to undertake a Digital Transformation project. Transforming your IT support function is no easy feat; therefore, it is crucial to fully consider what your service desk, the business, and the customers require, and review your infrastructure, resources, and processes to ensure that your organisation can implement new tools or technologies. Some implementations will need a change in culture, and this can be a particularly difficult transition for many organisations; this is, therefore, a significant factor to consider. It has been mentioned several times throughout this report that specific technologies are not new to the industry, yet implementation rates are increasing. One could surmise that rather than implementing new technologies, peopleâ&#x20AC;&#x2122;s attitudes are changing regarding the way they work. More modern frameworks, methodologies, and ideologies, as well as influences from the business and customers, are encouraging them to make use of the technology that is available to them, such as self-service, to transform their service to be more efficient and effective. Energy efficiency and solar power Energy price increases and the looming countrywide loadshedding are two of the biggest motivators to improve energy efficiency. There are many approaches one can take to reduce the amount of energy they are using, but the most popular one is solar energy. While often criticised as costly and ineffective, more and more people are opting for solar power due to its wide range of advantages and increasing affordability. The options range from an utterly off-thegrid system to a hybrid inverter and battery, which enables the user to integrate power from their solar PV panels, the national grid and batteries. It also incorporates a mobile app to track energy usage and savings in real time. provide up to 30% of an average homeâ&#x20AC;&#x2122;s energy and can cost anything from R80k and up. Going partially off-grid might cost less, but smaller systems only provide enough power for lighting and lower wattage appliances and typically do not power the geyser and the stove. up a few solar panels, there is no standard system, and each system has to be correctly sized to suit the needs and requirements of the user. solar panels are built to work in all climates, but in some cases, rooftops may not be suitable for solar systems due to age, slope or tree cover. Energy Efficiency continues from page 43 60% of the energy required for domestic hot water heating and contribute to central heating back up. In conjunction with a condensing boiler, free solar energy allows you to reduce your annual energy consumption for heating and domestic hot water by more than one third. Our product range also includes gas geysers that can operate on LPG or natural gas for domestic hot water or industrial heating solutions. Ensure that there aren’t any trees shading the panels. Solar panels require specific placement to generate the maximum amount of power. For maximum efficiency, it is recommended that solar panels should be installed perpendicular to the sun’s rays, and track the sun as it moves from east to west. Keeping your solar panels working and your roof in good condition is all about establishing proper maintenance procedures. To achieve a return on your investment will take several years. The initial outlay is, and hire-purchase models and monthly repayment options are not readily available yet. It’s a good idea to find out from your installer what those maintenance procedures are before the installation begins. If you are unable to meet those maintenance requirements, there is a good chance your equipment will not last as long as you want it to. Further to the installation of a solar system, you will need to follow up with your insurance provider on your coverage. Having the right insurance to cover both yourself and any damage to your property is something you need to consider. Even if a full system’s initial investment is out of reach, there are more affordable ways to take advantage of solar energy such as a solar thermal hot water heating system. This article looks at some of the challenges that face the electrical panel-building industry in South Africa. It will focus primarily on manufacturers who serve the industrial sector which include MMM, water, petrochemical, paper and pulp, cement, material handling, automotive, food and allied, and energy. It does not generally look at SOEs, municipalities, agriculture or commercial type projects such as shopping malls, hospitals, etc., but I suspect that manufacturers in these sectors face the same challenges. When we use the term panel builders, we are referring to manufacturers of low voltage switchgear and controlgear assemblies as defined in the IEC 60439, 61439 and SANS 1973 series of standards. In producing the presentation, I have invited input from several prominent and independent panel builders operating in the region, as well as statistical data from industry associations including SEIFSA, and feedback from the NETFA test laboratory of the SABS. OVERVIEW OF PANELBUILDERS There are three categories of panel builders: International OEMs who have invested in the establishment of manufacturing facilities here in South Africa. In most instances, core parts are supplied from the OEMs central plants overseas, while the manufacturing of selected components is done here before the panels are assembled and populated. In these cases, the designs are mainly developed and tested overseas. Usually have a comprehensive product range consisting of switchgear, drives, control equipment, PLCs and other intelligent devices. Typically prefer to sell a ‘total solution’ offer, and do not promote the concept of ‘other’ equipment in their panels. Their assemblies usually carry a comprehensive type test certification but are populated with the OEMs own equipment only. Designs which are compatible with more than one make of primary switchgear components. These are designs which are usually provided by system manufacturers who are not switchgear OEMs, OEM systems which are intended for principal switchgear components manufactured by the same OEM. (Their own product) South African Manufacturers who manufacture designs which were locally developed, and type tested at laboratories in South Africa and/or abroad. Panel Manufacturer Challenges continues from page 48 and many users wrongly assume their panels are no longer compliant. Although the SANS 10142-1 Code of Practice still refers to the IEC 60439 and SANS 1973 series of standards, many users, consultants and specifiers request compliance with the new IEC 61439 series, and this has resulted in most of the local panel builders re-testing their designs against the new standards. GENERAL OVERVIEW South Africa is at a tipping point. Record levels of unemployment, rising poverty levels and, increasing political uncertainty have created an environment where investors are understandably cautious and are instead seeking investment opportunities abroad. If we continue on our current low road, the prospect of an IMF intervention beckons, with the associated loss of sovereignty in determining our own economic future. Against this backdrop, we run the risk of a toxic cocktail of continued further deindustrialisation and job losses. Since 2001 our manufacturing sector has experienced a trade deficit peaking at a whopping R500 Billion in 2016. Since 2002, our manufacturing imports have exceeded our manufacturing exports, and manufacturing as a percentage contribution to GDP has declined as imports have increased. The paper encourages more significant commitment to support local manufacturers as a key element to stimulate economic growth and job creation. Since 2013 unemployment has reached a crisis level of 27.7%. Increasing labour costs have resulted in half a million jobs being shed. Wages are increasing, but productivity is falling. Between 2000 and 2011 labour cost increased by 34% while productivity increased by only 13%. Type testing is essentially a range of safety and performance tests to confirm the assembly’s design and build integrity against the manufacturer’s ratings for the product. Perceptions arose that the SABS laboratories cannot perform the full suite of tests required in IEC 61439-1 and 2. While not every test could be performed at NETFA, their Groenkloof laboratory and Gerotek could provide the services to fulfil the requirement. First prize, of course, would be that NETFA can perform all the tests. The SABS did indicate at various stages that some of the test facilities needed to be overhauled or upgraded, and so a new status report on the laboratories is now overdue. Damaging rumours were also spread that the quality of testing performed by the SABS laboratories was inferior. This caused some customers to insist on panels which were type-tested overseas. It was generally felt that these rumours were mischievous and with ulterior motives. There are other independent testing facilities such as Gerotek, and local manufacturers have appealed to the SABS to accept and recognise their testing for incorporation into the standard SABS test reports to confirm compliance with the IEC standards. It is clear that all test protocols and results must at all times comply with the IEC standards. Cost of type testing is prohibitive for smaller, South African manufacturers. It appears that local pricing has been based on the pricing of European test laboratories. Given the low manufacturing volumes here, it is virtually impossible to recover the cost of testing within a reasonable period. Given the fact that we need to grow local manufacturing, it follows that type testing should be more accessible and affordable for South African manufacturers. This will stimulate the necessary initiatives for growth. 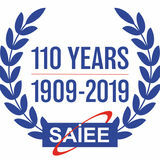 Some local panel manufacturers who performed their IEC 61439-1 and 2 type testing with independent test laboratories in Europe claim that their total testing costs inclusive of shipping, flights and accommodation was around 30% cheaper than they were quoted by the SABS in 2018. Besides, the waiting period for a testing slot was around two months, vs the nine months offered by SABS-NETFA. Until recently, the SABS laboratories would not perform ‘special testing’ or ‘development testing’ against selected clauses of the IEC 60439/61439 standards. This caused significant challenges for manufacturers who wanted to develop their products. It is understood that this issue has been elevated to Board level, and that agreement may have been reached to allow the testing as mentioned above. There is a need for the various SABS working groups to address the contradictions of multiple documents listed in the SANS 10142-1 code of practice. Over recent times a perception has formed at end-user level consultants and specifiers that internal arc mitigation is a standard requirement on switchgear assemblies. This is not the case. While the requirements detailed in the IEC 61641/TR can be requested it is optional and subject to agreement between the manufacturer and the end-user. I understand that SABS will or may have already addressed these issues at this conference. Independent local manufacturers often have to compete with OEM manufacturers, using that OEMs switchgear components inside their assemblies. This often puts the local manufacturer at a disadvantage, since his nett purchase cost for the parts is much higher than that of the OEMs internal manufacturing division, which enjoys favourable internal transfer costs for the components. 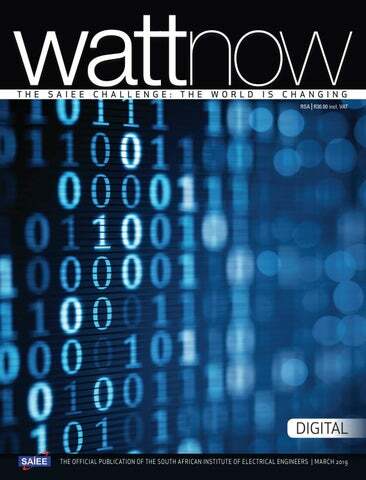 Panel Manufacturer Challenges continues from page 49 Switchgear components typically represent 45-55% of the total value of the assembly, and so it follows that the local manufacturer will suffer a rather substantial disadvantage on pricing. For this reason, mark-ups are usually substantially lower than that of the OEMs to be competitive. Local manufacturers have to compete with offerings from China, Eastern Europe, Malaysia, India, Korea etc. whose prices are often lower, but on many occasions, it has been found that the assemblies do not comply with relevant standards. OEMs often pass special project discounts to selected project houses, consultants or integrators equal to or better than the panel builders, who then free issue the switchgear components to the local manufacturers for incorporation into the assemblies. In some cases, local manufacturers are then approached to bring them up to standard and to issue a declaration of conformance (at extra cost). Sheetmetal, copper and labour alone do not provide sufficient income for the local manufacturer to remain viable under such circumstances, and it is felt that as resellers for the OEMs equipment, discounts should be so structured to allow the local manufacturers to add a fair mark-up, but still be competitive. Other challenges include compliance with the revised code of practice for BBBEE implementation and the new employment equity act. My understanding is that the commitment is there, but execution often brings some difficulty with meeting specific accreditation targets, for example ‘enterprise development’ and ‘employment equity’. When you operate in a harsh economic environment where margins are often limited to single-digit percentages, it can be difficult to spend 6% of your company payroll on training. In such times the focus may change from ‘transformation’ to survival’. In other instances, non-compliant assemblies are installed and commissioned on various sites. Another trend that has become evident is to procure chassis plates for electrical assemblies entirely populated and wired from suppliers overseas, essentially outsourcing the components, consumables and labour to companies abroad. Information gained indicate that these companies can buy the OEM components much cheaper than we can here. This has raised many eyebrows, as to how, for example, companies in Europe can buy OEM components, and export them to South Africa inclusive of duty, freight and mark-up, for cheaper than local companies can buy these components from the OEMs. There is a growing sentiment that local manufacturers are having to operate in an economic environment that cannot be regarded as ‘normal and stable’ and so they should enjoy some form of control on imports. Understandably this is a complex dilemma as we are witnessing in the USA, but it is clear that something needs to be done. incentivise local manufacturing. We should initiate a manufacturing culture awareness at schools and other learning institutions. As local manufacturers, we should commit ourselves to do more in-house training and skills development. We should strive towards increased productivity, better quality and a more positive approach towards the potential which lies dormant in our country. In the face of everyday doom and gloom, we need to continue the drive to convince the world that we are a viable and attractive manufacturing destination. This will assure the future stability of the SI and open the opportunity for the use of new technologies, including quantum technologies, to implement the definitions. The changes, which will come into force on 20 May 2019, will bring an end to the use of physical objects to define measurement units. The new definitions will not however affect the values of the units. Barry Inglis, Director of the International Committee for Weights and Measures remarked: “Today marks the culmination of decades of work by measurement scientists around the world, the significance of which is immense. We will now no longer be bound by the limitations of objects in our measurement of the world, but have universally accessible units that can pave the way to even greater accuracy, and even accelerate scientific advancement.” BIPM Director Martin Milton declared: “The SI redefinition is a landmark moment in scientific progress. Using the fundamental constants we observe in nature as a foundation for important concepts, such as mass and time, means that we have a stable foundation from which to advance our scientific understanding, develop new technologies and address some of society’s greatest challenges.” The new definitions impact four of the seven base units of the SI: the kilogram, ampere, kelvin and mole, and all units derived from them; such as the volt, watt, coulomb, ohm and joule. The previous unit definitions will be abrogated. •	The Josephson constant KJ = 483,597 848 416 984 THz V-1 = 2e/h (15 significant digits) •	The fine structure constant α = e2/2ε0hc = 7, 297 352 566 4… x 10-3 This number is frequently used as its inverse: 137,035 999 138… Prof Arnold Sommerfeld (1868-1951) introduced his fundamental fine structure constant in 1916. This is a dimensionless physical constant characterising the strength of the electromagnetic interaction between elementary charged particles. Prof Sommerfeld tutored a large number of prominent scientists, several of whom became Nobel laureates. very important domains of physics: electromagnetism in the form of the charge of the electron, relativity in the form of the speed of light, and quantum mechanics in the form of Planck’s constant. Constant α can be expressed in several different forms involving: e , ε0, µ0 , c ,ħ and RK . The symbol sr stands for the dimensionless unit steradian. ABRIDGED DEFINITION Taking the unperturbed groundstate frequency of the caesium 133 atom in Hz as 9 192 631 770 which is equal to s-1. Taking the fixed numerical value of the speed of light in vacuum as 299 792 458 expressed in m s-1. Taking the fixed numerical value of the elementary charge to be 1,602 176 634 x 10-19 expressed in coulombs, which is equal to A s.
Taking the fixed numerical value of the Boltzmann constant k to be 1,380 649 x 10-23 when expressed in the unit J K-1, which is equal to kg m2 s-2 K-1. One mole contains exactly 6,022 140 76 x 1023 elementary entities. This number is the fixed numerical value of the Avogadro constant. Taking the fixed numerical value of the luminous efficacy of monochromatic radiation of frequency 540 x 1012 Hz to be 683 when expressed in the unit lm W-1, which is equal to cd sr W-1, or cd sr kg-1 m-2 s3. as a Watt balance, has been renamed the Kibble balance in honour of Bryan Kibble at the U.K.’s National Physical Laboratory (NPL), who conceptualized it in 1975. Naming this extremely delicate instrument after James Watt may seem bizarre – Watt introduced the unit Horsepower to give prospective users of steam engines an easily grasped measure of the capabilities of the engines. The Kibble balance is an exquisitely accurate weighing machine. Like any balance, it is designed to equalize one force with another. In this case, the weight of a test mass is exactly offset by the force produced when an electrical current is run through a coil of wire immersed in a surrounding magnetic field. The surrounding field is provided by a large permanent magnet system or an electromagnet. The moveable coil, once electrified, becomes an electromagnet with field strength proportional to the amount of current it conducts. When the coil’s field interacts with the surrounding magnetic field, an upward force is exerted on the coil. The magnitude of that force is controlled by adjusting the current. Current and voltage are measured in two separate stages, or modes, of operation. The New SI Definitions continues from page 55 when it travels through a magnetic field, and that the voltage is exactly proportional to the field strength and the velocity. So if the velocity is constant, the induced voltage is a sensitive measure of the field strength. When the Kibble balance is used to take measurements the instrument must first be enclosed in a vacuum vessel. The National Institute of Standards and Technology (NIST) has operated Kibble balances of various configurations since the early 1980s, shortly after the device was first conceptualized by Kibble. NIST now operates its fourth-generation instrument, called NIST-4. superconducting circuit, with measurement uncertainties in the range of 1 part in 10 billion. The Josephson effect is the world’s de facto standard for quantifying voltage. Because of these connections to the Planck constant, a Kibble balance can measure h when the mass is exactly known (as in the case of a 1 kg standard), or it can measure an unknown mass if h is exactly known. The redefinition of the kilogram has assigned a specific fixed value to h, allowing Kibble balances to measure mass without recourse to the IPK or any physical object. of known dimensions carrying an electric current determined in terms of the realized ampere and the value of magnetic constant µ0 in the calculation of the magnetic flux density generated by the current carrying conductors. •	By using nuclear magnetic resonance (NMR) with a sample of known gyromagnetic ratio, for example, a spherical sample of pure H2O at 25°C and the most recent recommended value of the shielded gyromagnetic ratio of the proton y’p given by CODATA. The unit metre has come a long way since the metric system was given Royal approval on 30 March 1791. The metre was defined as one ten millionth of the meridian from the North Pole to the equator and passing through Paris. Even at this early stage it was deemed appropriate to derive the units from natural phenomena. The unit of length from the dimensions of the Earth and the unit of mass from the density of water. The distance from Dunquerque through Paris to Perpignan was triangulated in 1740 and then from Perpignan to Barcelona in 1792. From these measurements the metre was calculated and over the years standard prototypes made. The unit of length in France before the metre was the toise. The toise was divided in 6 pieds (feet) or 72 pouces (inches) or 864 lignes (lines) in France and used until 1812. In 1799 the metre was defined to be exactly 443,2960 lignes, with the intention that the metre should equal 1/10 000 000 of the distance from the pole to the equator. This had the effect of making the toise = 1949,03631 mm. With this major SI landmark in measurement science achieved, it seems unlikely that any further development of unit definitions will be required in the foreseeable future, however much further R&D may be required in the Mise en Pratique for the realisation of the units for the achievement of the required precision. Further development of single electron transport could well bring major advances to measurement precision. Our Expert Answers Information provided by Zest WEG Group Power transformers are subject to several stresses and changes in their operational life, so that they will eventually deteriorate to the point that it fails or must be replaced. Power transformer maintenance allows this aging process to be quantified and tracked to avoid failures. Utilities and service companies schedule power transformer maintenance programs to assess their condition, increase its service life, and provide safe and trouble-free operation. QUESTION ONE: Is it important to service and maintain distribution and power transformers? ANSWER ONE: Yes, it is! A good maintenance programme, as well as a comprehensive plan, can prolong the life of your equipment. The best way to achieve this is through interaction with the transformer Original Equipment Manufacturer (OEM) who would be able to recommend the most appropriate maintenance and service plan for the respective equipment. This would include inspection reports, thermal imaging and oil analysis, amongst other activities. then enables an informed decision as to what steps to take. Oil analysis focuses on a variety of aspects including moisture content and acid concentration. Monitoring of gas formation within the oil is vital as this will indicate the start of a problem. Thermal imaging should form part of a maintenance programme as this will allow the identification of abnormalities (hot spots) that could be related to poor connections or contact between conductive parts. All these aspects must be reviewed and considered to enable an adequately informed recommendation for a maintenance plan. What are the most common items that should be checked during the service? How often should a transformer be maintained and serviced? Transformers that have been in service for a few years will have accumulated dirt and dust, and this â&#x20AC;&#x2DC;pollutionâ&#x20AC;&#x2122; - as it is referred to - will eventually contribute to equipment failure. Cleaning the equipment is considered one of the most basic yet essential items that should be attended to and this must include the contacts of protection devices to ensure functionality. It is recommended that transformer maintenance is conducted annually and this will ensure that the end-user comply with all mandatory safety and OHS Act requirements. While it is the owner or end userâ&#x20AC;&#x2122;s responsibility to ensure that the equipment does not deteriorate to a state of risk to the environment, company or employees, this is not often done due to other more pressing issues. An inspection report will document the current status of the equipment providing a baseline for future maintenance requirements. It is always essential to undertake a visual inspection as this assists in identifying oil leaks and detecting broken or damaged seals or components that may contribute to premature failure. When transformers are kept clean, it is far easier on visual inspection to identify any issues such as oil leaks or broken parts. An example would be where the skirt of a bushing has been damaged or broken, and pollution then reduces the creepage distance to earth. and that the sample is sent to a reputable laboratory for analysis. All the oil analysis tests serve a different purpose, and the sample should be tested for water content, breakthrough voltage, acid content and dissolved gas analysis (DGA). The content of Polychlorinated Biphenyls (PCB) should also be checked and reported. For this reason, it is always recommended that OEMs be engaged to provide at the very least an annual inspection with associated repair and maintenance. However, it is not uncommon to implement maintenance programmes with six-monthly checks. This means that when a potential issue is encountered, this can immediately be addressed with suitable action by competent OEM personnel. What is the benefit of on-site maintenance and repairs? What is the expected outcome when a transformer is sent in for repairs or rewinding? ANSWER FOUR: The most important benefit is derived when an OEM is contracted to undertake this work as this ensures quality workmanship. Most transformers are equipped with safety devices to prevent serious or sustained fault conditions which could lead to catastrophic failures and damage to more than just the equipment. It is essential to inspect and maintain such instrumentation to ensure accurate monitoring of the transformer, and this should form part of the maintenance programme. A proactive approach to maintenance allows minor repairs to be done as and when required, preventing costly unscheduled downtime with associated production losses. ANSWER FIVE: The most critical step is first to ascertain if it is economical to repair and rewind a transformer. Transformers should be sent to a reputable OEM who has the necessary expertise to strip and assess the state of the transformer before making a recommendation. During this process, visual assessment, as well as a series of electrical tests and data collection, will allow the cause of failure to be determined and appropriate action to be recommended. Reasons can vary from end-of-life, lightning, spikes and surges to overloading and poor maintenance. Rewinding, for the most part, is the process of replacing the coils and all insulation and reassembling the transformer ensuring that it will operate within the original parameters (losses and impedance). March in History March is the third month of the year in both the Julian and Gregorian calendars. It is the second of seven months to have a length of 31 days. In the Northern Hemisphere, the meteorological beginning of spring occurs on the first day of March. 1966	It is thought the Soviet unmanned space probe Venera 3, crashed into the night side of Venus. Unfortunately, all its communication systems had failed before then. If the crash did happen, Venera 3 became the first spacecraft to land on another planet. 2018	South Africa earned a new Guinness World Record when a team, representing Clover brand Cream O’Naise, broke the record for the world’s longest line of sandwiches by constructing a sarmie-feast that measured a whopping 4,004.43 metres. 1972	NASA launched the Pioneer 10 spacecraft on a mission to explore the outer planets of the solar system. It passed near Jupiter and Neptune before leaving the solar system. After that, Pioneer 10 became the first of five artificial objects to achieve the escape velocity that would allow them to leave the Solar System. The last contact with Pioneer 10 was January 2003. 4 MARCH The United States’ Atomic Energy Commission announced that the first (and only) atomic power plant in Antarctica, the PM-3A, Naval Nuclear Power Unit, went critical and supplied power to the McMurdo Research Station. During its 10-year lifetime, the nuclear power station produced over 78 million kilowatt hours of electricity and created 13 million gallons of fresh water using the excess steam in a desalination plant. Though this device reduced the necessity for fuel imports, it was plagued with problems. Smoking tobacco was introduced for the first time in Europe by Francisco Fernandes. It was believed to cure anything from chronic diseases to minor aches and pains. NASA’s spacecraft, Dawn, entered orbit around the dwarf planet, Ceres, at 7:39 EST. The 7½ year journey of 4,900 million km was made with steady acceleration from ion propulsion. It became the first spacecraft to orbit a dwarf planet. Dr John Kellogg served the world’s first cornflakes to his patients at a sanatorium in Battle Creek, Michigan, USA. These were an unsweetened addition to the diets of his patients, who suffered from a variety of ailments, which he believed could be cured by a strict vegetarian diet and vigorous exercise. In 1906, his brother, Will Keith Kellogg, added sugar to the recipe and began marketing them as a breakfast food. Dr Kellogg so thoroughly disapproved of this development that he sued Will in a fruitless attempt to keep the Kellogg name off of the massproduced breakfast cereals. The Volkswagen Type 2 Microbus went into production. It is a forward control panel van that was introduced by the German automaker Volkswagen as its second car model. Following the Type 1 (Beetle) – it was given the factory designation Type 2. Brazil had the last factory in the world that produced the T2 series of Type 2, which ceased production on 31st December 2013, due to the introduction of more stringent safety regulations in the country. 9 MARCH 1611	Johannes Fabricius, a Dutch astronomer, observed the rising sun through his telescope and observed several dark spots on it. This is thought to be the first-ever observation of sunspots. Sir Ronald Ross, the authority on tropical disease, told the British Science Guild in London: “You throw your geniuses in the dust heap.” He pointed out that the man who discovered methods of vaccination against cholera (Waldemar M. W. Haffkine) and the man who found the cure for sleeping sickness (Sir David Bruce) were no longer employed in Great Britain. Ts’ai Lun invented paper, made from bamboo, mulberry, and other fibres, along with fishnets and rags. He lived and served as an official at the Chinese Imperial Court at the Han Dynasty in China. He presented samples of paper to Emperor Han Ho Ti. He was promoted by the Emperor for his invention and became wealthy. In China, before Tsai, Lun, books were made of bamboo, which was heavy and clumsy. Some books were made of silks, which were very expensive. In the West at that time, books were made of sheepskin or calfskin. 12 MARCH 1820	The Royal Astronomical Society (UK) was founded when 14 gentlemen met in the Freemasons Tavern, London and agreed to establish the Astronomical Society of London. It received its royal charter from King William IV on 7 March 1831. 13 MARCH 1781	English astronomer William Herschel detected Uranus in the night sky, but he thought it was a comet. It was the first planet to be discovered with the aid of a telescope. 196	The Gemini VIII capsule, piloted by David Scott and Neil Armstrong, successfully docked with an unmanned spacecraft, the Agena Target Vehicle. 2018	The world lost the last male northern white rhinoceros, aged 45. Sudan was survived by Najin, his daughter, and granddaughter, Fatu, who became the last two remaining rhinos of the subspecies on Earth. Physical problems have prevented females from carrying young. Using in-vitro fertilisation, perhaps the subspecies can still be regenerated. Poachers have caused the extinction of the subspecies in the wild. The largest cycling race at the time had 31,219 finishers and was the 2004 Cape Argus Pick ‘n Pay Cycle Tour in Cape Town, South Africa. The race was entered by 42,614 cyclists. The tour had humble beginnings, with only 525 entrants and 446 finishers in its inaugural 1978 running. The 2011 edition of the race capped the number of entrants at 35,000. 15 MARCH 1806	A 6 kg chondrite meteorite carrying carbon-based, organic chemicals - was unequivocally identified for the first time. It was seen ‘arriving’ on earth at 5:30 pm, outside Alais, France. The organic chemicals it carried suggested the possibility of life on whatever body was the source, somewhere in the universe. According to Swedish chemist, Jöns Jacob Berzelius's observations, it “emits a faint bituminous substance” when heated. John Holland (‘the father of the modern submarine’) demonstrated the first practical submarine off Staten Island in New York, USA for 100 minutes. Holland’s sub was not the first underwater boat but is credited as the first practical one. 1974	Atari Introduced Gran Trak 10, the first arcade game to use a solidstate read-only memory (ROM) to store sprites for each car, the game timer, the race track, and the score. As such, it was the first game to have defined characters rather than mathematically manipulated dots. The game’s controls, which include a four-position gear shifter, a steering wheel, and twofoot pedals, were also all firsts for arcade games. 1900	Nikola Tesla received a patent for the wireless transmission of electric power. 1935	Scottish physicist Robert Watson-Watt, considered by many to be the inventor of RADAR (RAdio Detection And Ranging), first demonstrate its feasibility. Watson-Watt had been experimenting using radio waves to locate thunderstorms and thought of the idea of using it to detect aircraft. 1980	The first transplant of a human fingernail was accomplished on a 12-year-old boy’s thumb, using one of his own toenails in Strasbourg, France. England beat South Africa in rainruined cricket World Cup semifinal. 23 MARCH 1840	Englishman John William Draper took the first successful photo of the Moon. He made a daguerreotype (image on a silvered copper plate), a precursor of the modern photograph. Mac OS X 10.0, the first public version of Mac OS X, was released. The code name for this release was Cheetah, although Apple did not start using the code names for marketing purposes until Mac OS X 10.3, Jaguar. 25 MARCH 1857	Frederick Laggenheim took the first photograph of a solar eclipse. 27 MARCH 2015	Soyuz TMA-16M was launched carrying three crew members to the International Space Station. Russian cosmonaut Mikhail Korniyenko and American astronaut Scott Kelly began a special year-long mission to test the effects of long-term habitation on the human body in space. The first seaplane took off from Martigues near Marseilles, France, designed by Frenchman Henri Fabre. 30 MARCH 1950	The invention of the phototransistor was announced. This was a transistor operated by light instead of electric current, invented by Dr John Northrup Shive of the Bell Telephone Laboratories at Murray Hill, New Jersey, USA. Britain’s Calder Hall nuclear power station was closed at the end of almost 47 years of service since it was opened on 17 Oct 1956. It was the world’s first commercial nuclear power station that was connected to a national electricity grid. Almost every primary product shipped nowadays, from home networking routers and refrigerators to medical equipment, the automobile, to the latest commercial aircraft, includes embedded software and remote connectivity. In most cases, the software inside these products can be updated in the field remotely; either automatically via the Internet, on-demand by the end user, or via a factory service centre. For the longest time, companies have been involved in discussions around the benefits of shifting their data and applications to the cloud. However, it’s increasingly apparent that the time for those conversations is over. 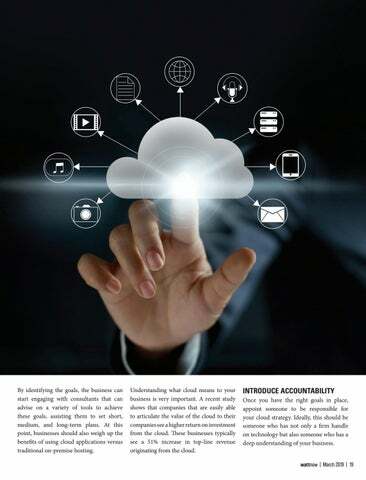 According to the Cloud Africa 2018 report, usage of the Cloud among medium and large organisations in Africa has more than doubled from fewer than 50% in 2013 to pervasive use in 2018. This new communications standard could transform architectural decisions across the industry, but not right away and not necessarily in distinct ways. 5G has been touted as the new enabler for many market segments, including mobile phones, automotive, virtual reality, and IoT. However, there are many questions and much speculation about when and how this new wireless standard will impact different market segments and what effect it will have on semiconductor design.